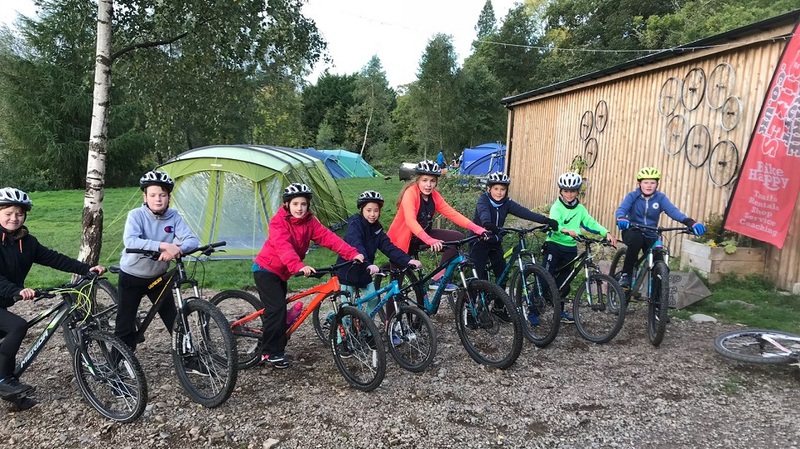 Last weekend, our Year 6 and 7 pupils spent the weekend camping, mountain biking, learning bush craft skills and just enjoying the great outdoors. This is the second time that St Leonards pupils have headed to Comrie Croft to enjoy the Perthshire countryside. The Comrie Adventure is scheduled at the start of the school year, as it provides a valuable opportunity for our two uppermost form groups in the Junior School to bond, share experiences and learn new skills. The boys and girls arrived early on Friday afternoon and soon set about making camp, unpacking gear and getting to know the site, and learning about the routines and chores that needed to be followed over the weekend. The group was blessed with clear skies in the afternoon, which meant that as soon as the sun dropped below the horizon, the air began to chill quickly. Everyone was treated to a fish and chips supper whilst sitting around the campfire and singing songs. Happily, Mr Shiells had brought his guitar with him, and a spot of music was a perfect end to our first day. Saturday involved a full day of mountain biking and bush craft skills. Comrie is an excellent venue for mountain biking, and after a few runs on the 'skills park' everyone set off up the hill and explore the different bike routes. Bush crafting involved lighting fires, using a Ghillie kettle and building dens. Another day of full sunshine meant that is was going to be another 'braw bricht and cold nicht'. Even with a hearty meal and singing around the fire did little to keep the chill at bay and this time, the temperature dropped to -2C. Thanks to Mr Barrable, Mr and Mrs Lindsay, Miss Carroll, Mr and Mrs Pennycook and Mr Goldsmith, the children were roused from their sleeping bags with the smell of bacon on the fire before they all set about breaking camp. Pupils were mindful of leaving the meadow in which they camped better than they found it, and after several group sweeps of the area, all that remained after the children had hiked down the hill to the bus were footprints in the dewy grass.